As we all know Austin is about to be swarmed with tourists in town for SXSW. A lot of these friendly out of towners are going to need sustenance to maintain their decadent lifestyle of wine, food and song. This article is for these sybarites. La Canaria: I’ve been eating from taquera Maria’s tiny kitchen for years. Homemade tortillas, best gorditas in town, great posole and long operating hours make this a good option for SXSW visitors. Chef Bryce Gilmore has handed the reigns over to his brother so that he may concentrate on his brick and mortar operation; Barley Swine. I haven’t been to Odd Duck since Chef Gilmore left but reports confirm that there has been no drop in quality. All Texas based sourcing with amazing pork dishes, grits, cheeses, eggs and greens. Some of the best meals I’ve ever eaten in Austin have come from Odd Duck. La Flor: Best hand patted (a vanishing art) corn tortillas in Austin, best desebrada in Austin, top flight salsa and a careful rendering of the classics put Chef Angela’s kitchen near the top of Austin’s food cart scene. El Taco Rico: Some may find it odd that the best Mexican restaurant in Austin is a cart in a laundry mat parking lot. I don’t. Chef Yolanda Sanchez-Cornejo’s pressed corn tortillas are the finest in town, her barbacoa is San Antonio-quality, which is to say world-class. She also puts out the best tostada in the city and her breakfast tacos are the best I’ve ever eaten in a restaurant. Austin has a world-class Mexican restaurant…and it’s in a cart…in a laundry mat parking lot. Deep Fried Mourning Dove Enchiladas anyone? Added March 2012: East Side King (In parking lot of The Grackle) One of my new favorite food carts. They’re religious on honoring their hours-an oddity in the fly by night world of Austin food carts. The food is insanely good. They offer two vegetarian options (eggplant and/or mushrooms) that are as good as any meat-based dish in town. Coming from a rampant omnivore that is the highest praise I can accord a restaurant. However, the chicken karaage and pork belly dishes stand near the top of my favorite plates of food in Austin. 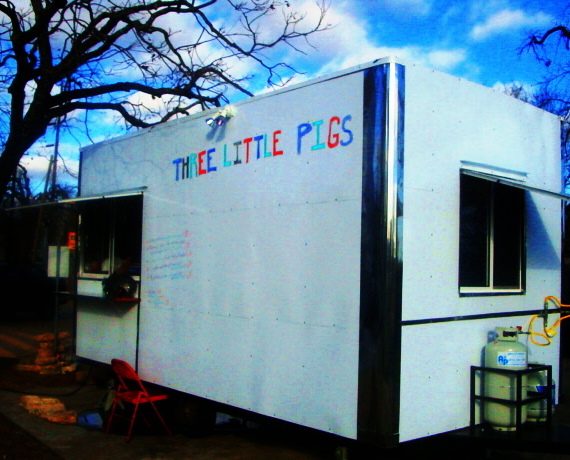 There are well over a thousand food carts in Austin currently. This is just a tiny, scratching of the surface of this vast scene. Countless other trailers race about town with quality varying from dismal to truly great. I’ll put hot links in comments below for some other good websites documenting this part of Austin’s restaurant scene. This entry was posted in FOOD, The Foodist and tagged Austin, barbacoa, breakfast tacos, corn tortilla, east austin, food trailer, hand patted tortillas, Mexican, Restaurant, salsa, scratch tortilla, south austin, sxsw, Taco cart, tacos, taqueria, texas, tortilla. Bookmark the permalink. Angela’s breakfast tacos are fine but she’s a meat expert. I haven’t had her flour tortillas in forever because her hand patted corn are extraordinary. If you make your way back down there be sure and try her desebrada. Cool write up! You should def. try Tacos Selene for some authentic tacos. They have everything from pastor to tongue. It’s by far one of my favorite trailers in town. You’ve inspired me to go to Taco Rico though. Do you know where I can get more info about them? I like Tacos Selene and have written about it in the past. However, Yolanda over at El Taco Rico takes the taco to an entirely different level.